Kill a Forsworn leader for a bounty reward. Any innkeeper in the Reach can give you this quest, as can the current steward. You will be directed to one of the possible Forsworn camps in the hold, and you will then need to obtain your reward from the jarl or steward of the hold. Go to the Forsworn camp and kill the leader (usually a Briarheart). Return to the jarl or the jarl's steward for the reward. Speaking with any innkeeper or the jarl's steward about work may lead them to give you a letter of bounty requiring you to kill a Forsworn leader. 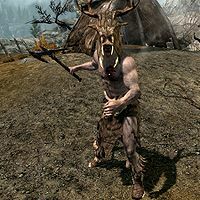 Head to the camp specified in the letter and kill the marked Forsworn leader. Then return to the jarl or steward for your reward of 100 gold. On the PC, it is possible to use the console to advance through the quest by entering setstage BQ02 stage, where stage is the number of the stage you wish to complete. It is not possible to un-complete (i.e. go back) quest stages, but it is possible to clear all stages of the quest using resetquest BQ02. This page was last modified on 30 April 2014, at 03:48.